I know my way around Microsoft Street & Trips (sort of)...have been using it for years, on my COMPUTER. Recently, I went back to work as an insurance inspector...purchased a Windows phone...& the GPS system that came w/ the phone is Here Drive. I've been using this for navigating to various inspections...but...IMO...it really sux. 1) Is a cellphone-based GPS system of MS Streets & Trips available...??? 2) If not...can I export addresses or even routes to my cellphone-based system from MS S&T? (Here Drive)...??? 3) As an aside: What actually IS the very best GPS system available today...for someone such as myself who absolutely needs road accuracy to make a living...& can it run on a cellphone...??? I don't like Streets and Trips, but if that's what you want then perhaps you should get a Windows tablet? I have an older Windows 7 based tablet and have tried Streets and Trips. It's awkward on a touchscreen, but it runs. It has a user interface very similar to the Nuvi. I used the iPhone version on a recent trip to Europe, but I was walking and not driving. Garmin gets their map data from Navteq ("here") as well, so I don't know if it would show the same routing oddities. I live in Southern NJ and worked in Philadelphia for many years. I rarely agreed with the routes that Garmin would calculate from PA to NJ, it likes to send you right through Philadelphia where the traffic is terrible instead of on 476. I'm a long time Streets & Trips user but that ride is coming to an end. As of July 1st, Microsoft has discontinued its entire group of PC mapping software products. There will no longer be new versions of MapPoint, AutoRoute, and Streets & Trips. So although current versions of S&T will continue to work, there will be no new versions, no map updates, and presumably no tech support etc.. Disappointing, but not surprising. I wonder if Delorme will follow suit with their Street Atlas USA product. I used to be a fan of Street Atlas, but it has been obvious for several years now that Delorme is no longer putting much effort into updates, new features, etc. I'm surprised that Microsoft didn't pull it long ago. But surely the writing has been on the wall ever since they announced their reorganization. Supporting a product like that has got to be a losing venture. 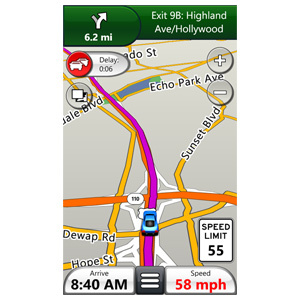 Garmin pulled their Windows navigation program (Mobile PC) several years ago. I actually started using Expedia Streets and Expedia Trip Planner.in the late 90's. That product eventually became Microsoft Streets & Trips 2000 when Microsoft spun off Expedia. So I'm kind of all broken up about S&T going away. :( It has helped plan many many thousands of miles of tirps for me over the years.